SolidFire hopes to shrink the size of storage systems. Enterprise workloads such as relational databases and email applications that demand consistent, high-performance storage systems might soon make their way to the cloud if AtlantaBoulder, Colo.-based startup SolidFire can sell cloud providers on its all-solid-state appliances designed to improve the speed of cloud storage. Beginning on Aug. 1, the Atlanta-based company, which raised $11 million in February, is offering cloud providers early access to its SSD appliances that it says will drastically reduce providers’ storage footprints while significantly boosting performance. Hopefully, SolidFire is just a drop in the bucket when it comes to using flash memory to open the door for new cloud services. The idea of an flash-fueled future helped drive Fusion-io’s (s fio) successful IPO just last week. However, whereas Fusion-io’s server components seek to cache data for web applications, SolidFire and its more-established (and richer) competition Violin Memory are targeting primary data storage for traditional enterprise applications. Even for enterprise-focused cloud providers such as Virtustream, Terremark and Bluelock, storage performance remains an issue even after security, compliance and other architectural concerns have been addressed. SSDs promise significant performance advantages over hard-disk-drives, and SolidFire is hoping that cloud providers will buy its appliances to address primary storage for performance-sensitive applications, such as databases and e-mail programs, that those providers are designed to run. But enterprise applications are just the starting point for what Flash could mean for cloud computing. Not only could appliances like SolidFire’s boost the overall performance of clouds by reducing the overhead associated with storing and delivering virtual machines, but they also could power new services around analytics, high-performance computing and other data-intensive workloads. Any application needing to read and serve lots of data with creating a bottleneck for today’s high-powered computing processors could stand to benefit from SSDs. One of SolidFire's SF3010 nodes. SolidFire’s appliances are built entirely using SSDs and utilize SolidFire’s own compression, deduplication and thin-provisioning software, part of its Element operating system. The result is a system that maximizes capacity utilization — the company claims 85 percent utilization rates — in addition to inherently improving performance and using less energy. 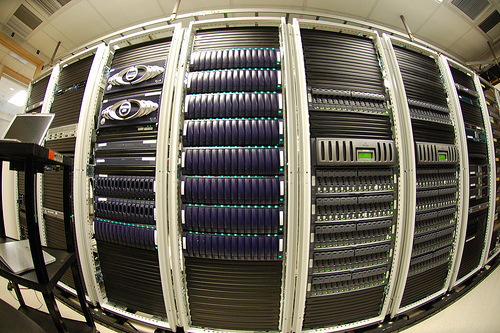 Each appliance consists of 10 drives in a 1U form factor, storing approximately 12TB and delivering 50,000 IOPS. SolidFire says they scale linearly to 100 nodes over a 10 Gigabit Ethernet backbone, delivering storage clusters capable of storing approximately 1 petabyte and performance of 5 million IOPS. As we’ll discuss at Structure 2011 this week, and as New Enterprise Associates’ (a SolidFire investor) Peter Sonsini told me last week, new infrastructure-level innovations such as flash-based primary storage will power new types of cloud services going forward. However, for some time, at least, a big hurdle to their effectiveness will be slow upload speeds that make migrating large amounts of data to the cloud a less-than-appealing proposition. But more applications are making their way to the clouds, and SSD storage will only boost that rate. Likewise, applications such as Facebook, Twitter and Foursquare are already producing large volumes of useful, web-based data. When all that data meets all those SSDs, who knows what new capabilities will emerge. Feature image courtesy of Flickr user ChrisDag. It is fascinating to me to see how storage solutions like this get smaller and faster as time goes on. I remember the “good ole days” when storage was 1m per terabyte, and SSD’s…forget it…too expensive. It will be fun to watch SolidFire as they take off!